Darvern - HOPE Farm, Inc.
Vernell Clardy is 81. Her son, Darvern, is eleven years old – a sixth grader at Como Montessori School. He’s also a herpetologist – but more about snakes later. Vernell grew up in the Lake Como area of Ft. Worth. That’s where she raised her children. She has seven. Five of which – all five of Vernell’s boys to be precise – are deceased. All five were killed young, and tragically, but not before they were able to bestow gifts that would later be restorative to a mom’s broken heart. In an expression of love that now seems foreboding, Darryl Clardy attached his mother’s name to his name and called his newborn son “Darvern”, pronounced like Darryl-Vern. Within months of the child’s birth, Darryl, Vernell’s last living son, succumbed to complications from a motorcycle accident. Vernell gained legal custody of her seven-month-old namesake and was a new mom once again. She was 70. Darvern knows Vernell is his grandmother, but he calls her his mom. They have a strong bond. When she laughs, you can tell she’s a youthful 81, and he is a kid wise beyond his years. They pair well. For most people, the mere thought of losing a child is painful – to lose five children is unfathomable. So it’s no surprise that Vernell is fiercely protective of her young charge – and unapologetically so. Darvern came to HOPE Farm when he was just six-years-old – Vernell had met a former staff member who invited her to come check out the program for Darvern. She’d already decided early on that she didn’t want him in after-school programs. She describes them as having “too many kids and not enough adult supervision.” She’s adamant about keeping a tight handle on the people he spends time with, in spite of her friends and family calling her overprotective. She doesn’t intend to parent him any differently. And when discussing the loss of her sons — four of the five were killed by gun violence – she’s equally protective of the memory of each one of them. She seems to purposely omit the reasons behind their death. For a mother, it doesn’t really matter, but she says at times her life seems like a dream. It’s hard for her to believe that all five of her own little boys are dead. There were times she had to ask God to keep her sane. Ironically, she believes his answer came in the form of more boys. Vernell has two daughters and a number of granddaughters from her seven children, but it’s her nine grandsons, ten great-grandsons, and two great-great grandsons that seem to be God’s way of soothing her sorrow. She is indeed a “boy” mom. And although she doesn’t think of her grandsons as replacements for the five boys she gave birth to, you certainly hear the delight in her voice when she talks about all the similarities – physical and otherwise – between her deceased sons and their sons. Darvern is the youngest of them and he loves reptiles. He REALLY loves reptiles. And you’ll quickly figure out in a conversation with him that his love for them goes far beyond a little boy’s fascination with creepy, crawly things. His passion and commitment to their study – every single aspect – makes him nothing less than a pint-sized herpetologist. He spends more than five hours online each day after he finishes his homework researching the latest topics that “people in the hobby”, as he calls the network of reptile enthusiasts he follows, are exploring. Once you get passed his vast knowledge, you’re further blown away by his ability to communicate in a way that surely rivals Ph.Ds in the field. You may even forget you’re talking to a child. In a conversation with him about geckos and pythons – you’ll be schooled in great detail on their biology, their physiology, ecology and extinction, or how they’ve evolved throughout their history on earth. You may also get a lesson in snake breeding and how to create unique patterns and coloring that the world has never seen. You’ll undoubtedly be introduced to Brutus, Darvern’s most prized possession, a three-year-old leopard gecko, who Vernell, in spite of being anti-reptile, speaks fondly of as well. Together they make two to three trips per month to PetSmart to buy worms and crickets for Brutus’ lunch. Caring for Brutus is a team effort, albeit reluctantly for Vernell. Darvern has written her notes begging her permission to let him breed snakes in her house. He’s even drawn up his own “employment contracts” for friends who he plans to hire to work in his breeding business. 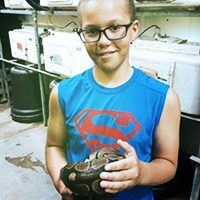 Vernell is not on board with snake breeding – not many people would blame her – but after talking with him, you can’t help but root for him to have his wish granted. The fact that one conversation with him about snakes will undoubtedly change the way you think about one of the most loathed creatures on the earth is evidence that he is special. You can hear his frustration when he talks about why snakes have such a bad reputation. He places blame squarely on what he describes as Satan using a serpent to do his dirty work back in the Garden of Eden. You can’t blame the snake, is how he sees it. And after just a little while with Darvern, you’ll no longer want to..